He is the founder of Vanguard, one of the world's largest mutual fund organizations, and the author of The Battle for the Soul of Capitalism (2005), which addresses "how the financial system undermined social ideals, damaged trust in the markets, robbed investors of trillions -- and what to do about it." 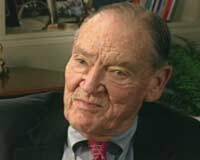 In this interview, Bogle discusses why the entire retirement system is faltering and, in particular, criticizes the mutual fund industry for emphasizing salesmanship over stewardship in pushing 401(k) plans. He also warns 401(k) investors' against mutual funds' costs and fees, which can consume a huge portion returns over the long term. This is an edited transcript of an interview conducted on February 7, 2006. With regard to defined benefit plans -- lifetime pension plans that give you a certain amount of money as long as you live -- you are saying that the private sector, corporate America, is underfunding its lifetime pension plans? The whole retirement system, in fact, in the country is in, I think, very poor shape, and it's going to be the next big financial crisis in the country, I honestly believe. ... The private pension plans are underfunded by an estimated $400 billion, and the state and local government plans are underfunded by an estimated $800 billion. That's a $1.2 trillion shortfall between the assets the plans have and the liabilities they will have to the pensioners as they pay out their retirement checks over the rest of their lifetimes. Editor's Note: Estimates of the underfunding of state and local government pensions plans range from $460 billion to $700 billion. How do they get away with that? Don't they have to fund them? No, they don't, because a lot of it is based on assumptions. Our corporations are now assuming that future returns in their pension plan will be about 8.5 percent per year, and that's not going to happen. The future returns in the bond market will be about 4.5 percent, and maybe if we're lucky 7.5 percent on stocks. Call it a 6 percent return -- before you deduct the cost of investing all that money, the turnover cost, the management fees. So maybe a 5 percent return is going to be possible, in my judgment, and they are estimating 8.5 percent. Why? Because when they do it that way, corporation earnings become greatly overstated, and all the executives get nice, big bonuses. They are using pension plan assumptions as a way to manage corporate earnings and meet the expectations of Wall Street. So if a company overstates the value of its pension plan assets, it makes the company look better to Wall Street, so there's an incentive to kind of exaggerate, if not cheat. That is precisely correct. And let me clear on the cheating: It's legal cheating; it's not illegal cheating. In other words, you can change any reasonable set of numbers -- and corporations have done this, have raised the pension assumption from 7 percent to 8.5 percent -- and all of a sudden that corporation will report an earnings gain for the year rather than an earnings loss that they would otherwise have. Simple, legal. This spring , we have seen IBM freeze its lifetime pension plan, Verizon freeze its plan; Motorola did it before, Hewlett-Packard; [we've seen] other companies freeze them. You see companies like United Airlines or LTV [Steel] and others dumping their pension plans on the government pension agency through bankruptcy. If these lifetime pension plans make the corporate bottom line look good, why are corporations junking them? I think the reason corporations are junking these plans is because they are so underfunded, they realize they can't keep up. Those estimates which we talked about that were much higher than companies could possibly earn in these pension assets are not coming true, so that's part of it. The companies want to avoid a day of reckoning. that kind of volatility to the public. The Pension Benefit Guaranty Corporation [a federal agency, financed by premiums from corporations, that insures failed pensions plans] is now sitting with $20 billion in deficits, almost all accumulated in the last five years: LTV, $2 billion; United Airlines, $9.8 billion. And employees are saying to us, "They made a promise; we took deferred wages; how can they do that?" And the bankruptcy courts say the companies have to do that in order to reorganize. As a man who's looked at the market for a long time, what is your assessment of that phenomenon? When a company falls on the kind of hard times that the companies you've indicated have, ... there is not a lot of recourse. ... They really don't have much choice but to throw it over to the Pension Benefit Guaranty Corporation, which is greatly underfunded. ... The economic system is a very, very tough taskmaster. And the companies, in some cases, even if their pension plans are fully funded, they can't go on. The cost of health benefits as well as retirement [benefits] -- and health benefits are going to be even larger -- account for something like $3,000 of the cost of a typical American car. Editor's Note: GM officials have stated that health care adds $1,500 to the cost of a new car; Ford has put the figure at $1,000 per car. But we're talking about companies here that are coming in with their benefits grossly underfunded. What is your take on those companies that are doing that, then going bankrupt and leaving everybody in the lurch? Well, sooner or later we've got to get some sense of reality, and it begins with accounting rules. We have to have much stronger rules on what kind of future rates of return you can assume, how often you have to report the value of your pension plan. Do you realize that in corporate annual reports, they don't even have to report the returns in their pension plan? They don't have to tell you, for example, that we are assuming an 8.5 percent return in our pension plan, but in the last six years we have earned 2 percent a year. That's not a disclosable item. I think we need much better disclosure. On the other hand, ... that's going to make companies very leery of continuing their pension plans simply for, if you will, accounting reasons. But this is really the thing that's most bothersome of all: All of our retirement system is faltering. We all know that Social Security is faltering. We all know that state and local governments are faltering, not just corporations. And we all know that the corporation pension plans are faltering. We know that 401(k) is faltering. And we know people aren't making nearly adequate use of individual retirement accounts [IRAs]. We have a system that is troubled, and I don't see that our administration or our Congress is giving it the attention that it really has to have. I don't think anybody has a crisis kind of an attitude towards this. And if it's a crisis, I think it would help to have a crisis attitude. You mentioned before a bailout. And you compared it to Hurricane Katrina. What did you mean? The perfect storm comes into New Orleans, and the citizens of this country are going to pay something like $100 billion to repair the damage from Katrina. I would say that $100 billion would be cheap to repair the damage to our retirement system. I think it's going to cost more than that. And the taxpayers are going to foot the bill. Believe me, the government doesn't pay anything, the taxpayers pay everything. Are we headed for something like the savings and loan bailout? I don't think we need a savings and loan-type bailout, because these problems, unlike the real estate problems that engendered the savings and loan bailout, are much more gradual in nature. We have a little time to catch up and to increase contributions to the system. Are we headed for a bailout that taxpayers are going to have to foot the bill? That's what the Pension Benefit Guaranty Corporation is, a bailout mechanism. If it doesn't get enough revenues, the president is going to have to propose and the Congress is going to have to approve substantial additions to the Pension Benefit Guaranty funding, because the deficits there are getting bigger and bigger. In general, are retirees better off with pensions? I'm not talking about wealthy folks. Take the average median salary -- somewhere between probably $45,000 to $47,000. Are they better off with a defined benefit life pension plan if they stick with the company or better off investing for themselves in a 401(k) program? It's very difficult to say in the abstract, because it depends on how much you put in and how much the company matches and things of that nature. It looks, on the record, that the pension plan is much more effective because the pension plan, through the corporation, has a discipline. They don't skip payments. They may be making them inadequately, but they don't say, "Well, I'll put this aside and buy a rug this month." That's not an issue over there. It's the lack of discipline in the defined contribution plans [401(k)s] -- people don't make their contributions, don't put money in their IRAs, don't put adequate money in their corporate thrift plans -- that causes them the shortfall. For companies, are those lifetime pension plans more expensive to fund than a typical employer match in a defined contribution plan -- a dollar-for-dollar match or a 50 percent match? The pension plan is much more expensive, and therefore the 401(k) plan, the employee savings plan, really is not adequate funding for a retirement. It's supplemental funding. You put away maybe 3 percent of your salary, and the company might match that $1 for $3 or $1 for $2, or dollar for dollar even. But putting away 6 percent, if you get a 3 percent contribution and a 3 percent match, simply isn't going to give you an adequate retirement. 401(k) plans were essentially designed as savings plans to supplement retirement income, so when a corporate defined benefit plan is terminated, the company really has to not just give you a defined contribution savings plan, but an extra defined contribution pension plan. In fact, this is what IBM is doing. Most companies haven't revealed their plans, but they are going to have to give you an extra 5 percent or 6 percent of your salary to make up for that difference. What do people need to put aside to have a decent retirement that will enable them to live at roughly the same standard of living that they were living at when they were working? To begin with, it's age-intensive. If you start early, it can be a much smaller portion. If you get to age 40 and haven't started, you probably have to put away 25 percent of your income. So what do you say to the great mass of people who feel terrific about putting away 6 percent a year, with a 3 percent employer match -- that is, 9 percent a year combined starting at around age 35? What do you say to them? You'd better step it up if you're putting 9 percent in at age 35, and you'd better also do some other very significant things. One, you'd better keep [the investment] costs down so you aren't overwhelmed by the tyranny of compounding costs, whatever market return you might get. ... Investors should realize [they] don't get the market return. In a 9 percent market, we all share 9 percent before we pay the cost of financial intermediation, and after we pay those costs, which are about 2.5 percent a year, we get 6.5 percent on a 9 percent market. In effect, you are saying the system is set up for this pattern. Turn it over to the Pension Benefit Guaranty Corporation. Well, you turn [underfunded] pensions over to the PBGC, and then they don't pay you the same retirement that the company had promised you. That system is busted, too, so we don't have a lot of safety valves here. How does managerial capitalism affect the way the 401(k) system is operating? Is there the same kind of deleterious effect on employees because of the way the managers are running those programs? Sure there is, because when you get over into the defined contribution system, you are basically using mutual funds, the largest investments in that system, and those managers are taking too big a share of the rewards. They are paid on building a big company on marketing, on creating more total management fees, rather than getting better and better performance from the funds. It's a hard business, because we all try to get good performance for our shareholders. I'm the first one to admit that, but in the long run as a group, we are not all above average; we are all average before costs and below average after costs [are deducted]. If managers were not operating in their own self-interest in setting up retirement plans, how would they behave? What would they do? If you were to just design the perfect retirement plan, you would own the stock market or you would own the bond market. You would get all the costs or all that you possibly could out of the system. So on an annual basis, if the market went up 8 percent, you would get 7.8 or 7.9 percent. Or take the federal Thrift [Savings] Plan [TSP]. This is something interesting we might talk about. The federal government has a defined contribution plan, a federal employees' Thrift Plan. And guess what they do? They buy index funds and just a very simple line. You can actually have a government bond account or a U.S. index or an international index. So our legislators and our federal employees get these great benefits through as close to a perfect retirement plan as you can have owning the financial markets and holding them forever. We don't do that for our regular citizenry. It's quite a contrast, and the federal Thrift Plan is not small -- it's about $150 billion -- and so our federal employees don't have to worry about the problems we are talking about here today. Indeed the Bush administration, to their great credit, when they wanted to put private accounts in Social Security, they proposed a federal Thrift Plan kind of solution. So it's not just me who is saying index the market, capture the market's return, get costs out of the system, be bored to death and have a comfortable retirement. It's the federal government, and it's even the Bush administration -- which you know certainly likes private enterprise, but here they are turning it over to an unmanaged mutual fund. Talk to any Nobel laureate who has ever won the economics prize, they are going to tell you [to] index. Paul Samuelson recently described the creation of the first index fund as the equivalent of the wheel and the alphabet. That's pretty strong stuff, by the way; I don't think it's quite that good. But ask college professors in finance what they do and what you should do. They'll tell you [to] index. Then ask them what they do, and they'll say, "I index." But you can't crank this low return to the financial system, high return to the investor into the mainstream of American investing, because we have dreams of glory. We all think we are above average, and we have a mutual fund industry that has become a giant marketing system [where] the idea is to bring in the most money by fair means or foul.